Every Friday we invite you to stop by and take a look at new videos that have been submitted or recommended or that we tripped over walking by the railroad tracks. This year we showed you about 250 of them. We call it BSA Film Friday and it travels with us to cities around the world now when we do it LIVE with you and other audience members in theaters and lecture halls and museums. The beauty of the video/film form is you can get a full story quickly, and you are often surprised by how transformative it can be. You can also see how many people are affected by urban and street culture through these films – we see people’s eyes light up when they realize that they too can create in public space, that the world is not simply a product but is a piece of art that many of their peers are now jumping in to co-create. As a collection, these 15 are illuminating, elevating, riveting, strange, soaring, and achingly beautifully normal. From looking at the Separation Wall and Banksy to a travelling crew of graffiti writers on farms in Polish pig country to the amazing dance troupe who interpreted the 5 floors of art installations in a downtown Berlin former bank, you have before you a massive buffet of a visual feast. The final desert is hand-held phone video caught in the moment last month in Mexico City. We didn’t know Keith Haring was coming down the tracks to surprise us, and we didn’t know that this unpolished jewel would garner thousands of viewers and commenters – effectively placing this little piece of video at number 1 for its popularity. Maybe the fact that it is so raw is what people relate to – along with an ongoing adulation for Haring. 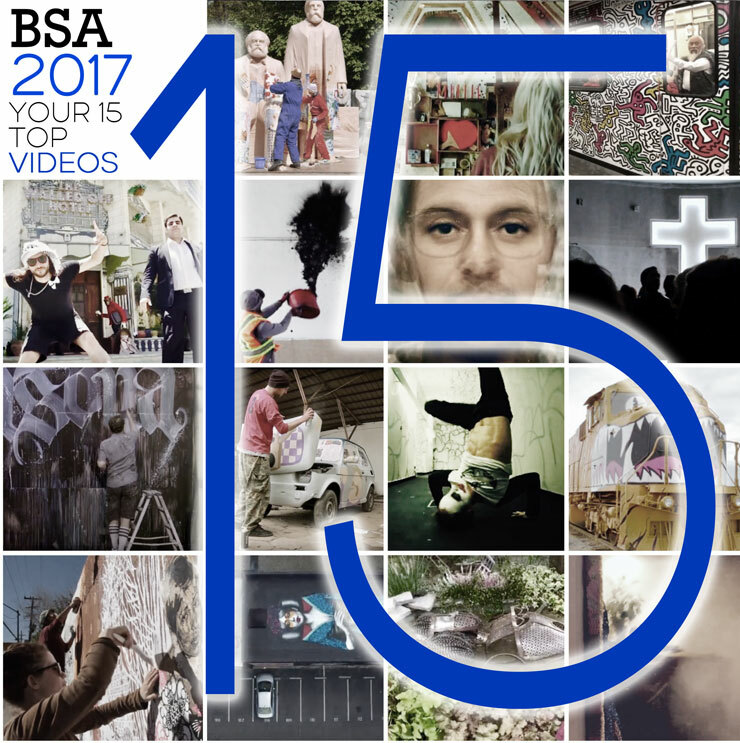 We hope you can take some time to enjoy some of the best Street Art videos from around the world and on BSA this year. “Distant universes delicately tangled,” says the near-whispering narration as you are gazing upon scenes from Hong Kong – those interstitial moments that carry you between the more remarkable ones. Faith XLVII gives us a quiet look at these inside a the dencse cacophony called “Aqua Regalia”, looking at the parts of a culture that a visitor is sensitive to because they are not taken for granted. With this ability to see, one takes a quick course of a city, a society. Invariably you end up with more questions. “We speak of death and birth in terms of celebration and mourning.” Faith XLVII is in search of more universal truths, the timeless ones, since we understand them so poorly. Herein are glimpses, romantic and unvarnished. Borondo keeps it open for you. He provides the stage, the staging area, the proscenium, the altar, the emanating light, the associations and memories you have with your belief system, or lack of one. During his artist residency with Pubblica, curated by Carlo Vignapiano and Elena Nicolini in May, the Street Artist (among other things) creates a journey as much as a destination in this intimate chapel. The video by Gerdi Petanaj captures this and perhaps a little more. From the moment it opened on April 1st, the Haus was a hit! BSA was very lucky to be there in February for a full tour while still in development in Berlin, nearly dancing ourselves through all five floors of this former bank with full scale installations in places that once held offices, conference rooms, employee coffee lounges. By inviting Creative Director/dancer Serdar Bogatin and the film crew “Shuto Crew” into the space with members of the Lunatix Dance Production troupe, these spaces and art environments come completely alive, invoking stories and dramas – clearly making the spaces into elaborate set-design pieces. The French duo Ella + Pitr here revel in the simplicity of the gestural act of a full-body full-bucket splash of black paint. Carnal, visceral, overlaid with psychographical information, the motion of splashing inky pigment across a white quadrilateral is an act of defiance and a release of the inner chaos – instantly recognizable as chaos elsewhere in the world. The uncontrollable quality, especially when purveyed within an atmosphere of prim control, provokes amplified emotions in some. Fear, liberation, rage, release. Which ones will you experience? “This reminds why I hate vandals! All this does is create more unnecessary work for the guys at the paint shop,” says a commenter on the Vimeo page where INDECLINE has posted this locomotive takeover. You see kids, this is why we can’t have nice things. I just mopped this floor and you come running in here with your muddy boots! For Pete’s sake. Truthfully, this decidedly unpolitical piece is a surprise coming from INDECLINE. Guess they were taking the day off from railing against hypocrisy and injustice with this animated train that recalls Saturday morning cartoons like Bugs Bunny and the Road Runner. “It is one thing to read about the events in those parts of the world, but it is something totally different to actually look in the eyes of the women who lost everything while running from the war,” says artist Olek about how her world view changed when crocheting the project featured this week. While gathering and producing materials for her installation with Verket Museum in Avesta, Sweden, the Brooklyn based Street Artist was holding informal crochet workshops with volunteers who would be producing the decorative yarn skin that covered every single item inside and outside of the house with their handmade crochet stitches. Some invited guests were refugees who had escaped war in Syria and Ukraine and the artist and local folks shared stories and crocheted, sewed, and prepared the art materials together over the course of a number of days. It was during these exchanges of personal stories that, “a conversation started that has changed me forever,” she says – and she immediately needed to reflect it in her project with the museum. This unvarnished quality bypasses the styled self-awareness of a lot of commercial media, and the anger actually comes across as fear. Perhaps you’ll think its too dark in demeanor – but then suddenly the melding together of the faces into one common entity makes it magic, even transcendent – revealing a simple sameness of everyone. “This suspenseful individuality of the people is almost completely dissolved in the chorus,” says Sebastian Purfürst of his video with bandmate Markus F.C.Buhl. Together they are called SONICONOCLASM. Pixel’s original installation was nixed by the city at the last moment but that didn’t prevent the Italian Street Artist from rallying to find another solution! This new installation in the back courtyard was conceived of, designed, and constructed over a period of 4 days last week and became the secret surprise behind the museum for those who wandered there. Using landscaping techniques and botanical knowledge that come naturally from his farm in Italy, the artist create a mise en scène of epic impact with his robotic folk-futurist sculptures. Night time lighting took it to another world, but you can see the details better here in this short video Jaime Rojo shot on site. “It’s almost become a playground for people to come to,” says your host Doug Gille as he looks at the section of the Separation Wall that the Banksy “Walled Off” Hotel is installed upon. “I think it is so crucial for people not to just come to see the wall or to paint on the wall,” he says. “50 years under military control makes it the longest occupation in history,” is a quote that Gillen brandishes across the screen from the United Nations. The fact that Banksy is using his art star power to keep this on the front burner says a lot about the man. “I think a lot of these people feel like we are forgetting about them and we have to remind them that we’re not,” says Gillen as he soul searches next to the Dead Sea. Conceptual Street Artists often perform interventions without explanation, satisfied with their own observations of the outcome. For Berlians Various & Gould the process has more often included the participation of the public – a way for more to take ownership and inspire dialogue. Sometimes many dialogues. You may have seen our piece on their most recent public project called “City Skins”: Marx and Engels Statues Re-Skinned & Re-Located : Various & Gould. Here is a mini-documentary that shows you the artists, the process, and the thinking behind the process. Now to the Polish pig farms! Another Street Art/Mural road trip movie, this time across Poland with JAYPOP, Seikon, Krik KONG and filmmaker Cuba Goździewicz. See the discoveries, the relationships, the reactions to the work from a warm and considered human perspective. The beauty of randomness and the randomness of beauty. These guys are fully engaged with their surroundings, the opportunity, the myriad people they befriend or portend to make allies. It’s an uncharted trip where permissions are sought and often refused, but they never stop painting somehow. Using existing and new footage of Street Artist Swoon and selected interviews with people in her orbit, director Fredric King presents and hour long documentary that looks over two decades of art making. The stories told and the insights that Calendonia Curry aka Swoon presents while en route to her next adventure illustrate the fluidity with which she pursues the creative spirit, whether on the street, on a vessel down a river, or installing in a museum. An integrated explorer, Swoon brings you into the fold to go on this journey that always feels like its just begun. On an expansive rooftop in rainy/sunny/rainy San Francisco, Street Artist Fin Dac brings to life ‘Shukumei’, an ebullient and mysterious muse. The film is largely a stop motion record of the work set to music, but did you notice how much dexterity and effort goes into this precision play when you are working at this angle, basically painting the floor? The remarkable integration of the glowing skylight orb, dramatically revealed, imparts the figure a mystical dimension as well. Video editing by Tonic Media, Soundtrack by Mombassa/Lovechild, and shout out to Ian and Danielle at Rocha Art and Missy Marisa, model. Niels Shoe Meulman spent some nights in a Munich jail thirty years ago for mucking about on the walls. This year he was paid to do it in Munich for Magic City, the travelling morphing exhibition (now in Stockholm) where Street Art is celebrated along with all its tributaries – including a film program and a number of photographs by your friends here at BSA. Born, raised and based in Amsterdam, The Netherlands, Shoe shares here his new improvisational piece and some of his reflections on his process and his evolution from being in advertising as an art/creative director and reclaiming his soul as a graffiti/Street Art/fine artist. As ever, Martha is in the frame, putting him in the frame. This rough cut lil’ video reached more than 300K individuals and had 100K views with thousands of shares on FB and on Instagram with dozens of comments and high engagement was easily propelled to the #1 spot. It all took us by surprise last week in Mexico City when suddenly a whole train covered on both sides with Keith Haring’s work approached while we were waiting at the platform to catch the Linea 2 of the Metro. He made his name in part by illegally doing drawings like these in NYC subways and here now they are crushing a whole train. The name of the project is “Ser Humano. Ser Urbano” or “Being Human. Being Urban” and it aims to promote human values and human rights. The pattern you see is from “Sin Titulo (Tokyo Fabric Design)” – now stretched across these whole cars, if you will. The train itself is inexplicably having brake troubles, so we get some jerky spur-of-the-moment footage but all week on Instagram and Facebook we’ve received tons of comments from people reacting to this little bit of Keith video by Jaime Rojo on BSA. Today just one video that isn’t Street Art. But it is the street. And it is art. For graffiti writers and Street Artists who traverse the streets and blocks and empty lots and tunnels at night, you see a side of the city that is hidden, imperfect, and often rather rough. Whether its catching a quick tag or spraying out a 3-day installation on the Houston Street wall, you keep running into people. In the case of Houston street it is an endless stream, sometimes a river, of thousands of people during the course of the day and night. Soniconoclasm by Sebastian Purfürst / Lem Studios. Photo stills from the video. We’ve even stayed up with artists painting through the night on Houston and seen the sun coming up again on the pavement, long stretches of roaring trucks and cars and thumping stereos and screeching brakes and police sirens accompanying giggling bridle showers, pumped up loudmouthed bros, sarcastic leathered rockers, preppie helicopter moms, khakied dads, tired sanitation workers, drugged dreamers, earnest art-school students, lonely ladies in short skirts, head-down dishwashers, bored suburban teens looking for any kind of adventure, greasy mechanics, bug-eyed investment bankers, smile-gleaming media wiseguys, power-ponytailed sports joggers, washed out addicts, bearded ladies, muscled jocks, winsome winners, losing lotharios. Everyone owns the city and everyone is owned by it. Soniconoclasm by Sebastian Purfürst / Lem Studios. Photo still from the video. Lyrics by Sebastian Purfürst and Markus Buhl. Sebastian Purfürst at LEM-Studios, Berlin. Mastered by Lupo @ Calyx Mastering, Berlin.